Time flies and especially for pilots! It is time again for light sport aircraft enthusiasts to gather in sunny Florida for the U.S. Sport Aviation Expo! Whether you fly in or drive in, are a present light sport owner or just looking, the Expo has something for everyone. The U.S. 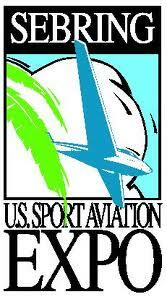 Sport Aviation Expo kicks off this Thursday, January 16th and continues throughout the weekend. Each day, attendees can participate in aviation workshops and forums and other activities. Enjoy performances by the Flying Musicians and stop by Show Center at 1:30 to see which keynote speaker is featured. Next enjoy the manufacturers showcase and an airshow at the Main Stage. It all ends Sunday at 2:30pm with awards, prizes and the 4th Annual Sebring Send-Off to the Bahamas! From the Seaplane Base to the Main Stage, Aviation Insurance Resources agents Chris Wolbert and Joe Cacho will be on the grounds of the Expo this week. They are looking forward to sharing their knowledge of LSA aircraft insurance, meeting new friends and catching up with current customers. Licensed in all 50 states, AIR provides a wide range of aircraft insurance options for aircraft of all makes and models, from Light Sport Aircraft to large jets. AIR offers insurance on several LSA makes and models including, but not limited to: BushCat, Flight Design CT , Czech Sportcruiser, Cubcrafters, Carbon Cub, Evektor, Tecnam, Cessna Skycatcher 162, Bristell, and more! If you need assistance in understanding Light Sport Aircraft insurance or wish to find out what aviation insurance discounts are available, please contact Aviation Insurance Resources by calling 877-247-7767 or visit AIR-PROS.com today and receive a free Aircraft insurance quote!